1. Sun - Lighting is the number one factor in getting a great outdoor shot. You can use a flash, but often times, the final product will come out looking artificial and not quite right. The light from your camera's flash tends towards the blue end of white (cool light), whereas the sun tends towards the yellow side of white (warm light). The sun's warm white lighting makes your flower photos seem more natural, more welcoming, and much less artificial! Come out mid morning, mid day, and/or mid afternoon to catch the best sunlight with much fewer shadows. Early morning or late afternoon sun will cast far more shadows on your subject, and/or you may have inadequate lighting altogether, requiring a flash. 2. Focus - The second most important factor in obtaining a great flower photo is focus. Focus, Focus, Focus - It's often repeated because it really is that important. If you find the most perfect flower in the whole world, but your camera is focused on the grass or mulch or flower foliage in the background, you might as well have not even taken the photo. You can focus your camera either manually or automatically if you have a DSLR camera or automatically if you have a point and shoot camera, but the key is to focus. Auto focus can work - as long as the subject is what's in focus. If you are using the auto focus feature, most cameras (either point and shoot or DSLR) will have something on the screen that alerts you as to what the camera is focusing on, right before the shot is taken (like a box around the subject in focus or some points that light up on the screen showing what parts of the shot are in focus). Many times if you press the shutter button only halfway down, you have the opportunity to focus (and refocus if it's incorrect) before you depress the shutter button fully to take the shot. Sometimes if you press the shutter all the way down too quickly, the camera is either not focused at all (resulting in a very blurry image) or focused on the wrong thing (resulting in the wrong thing being in focus and a blurry or slightly blurry subject). 3. Flower - Primp it! This may not be a flower exhibition, but if you're going to the trouble to take a nice photo, you want your flower to look its best. 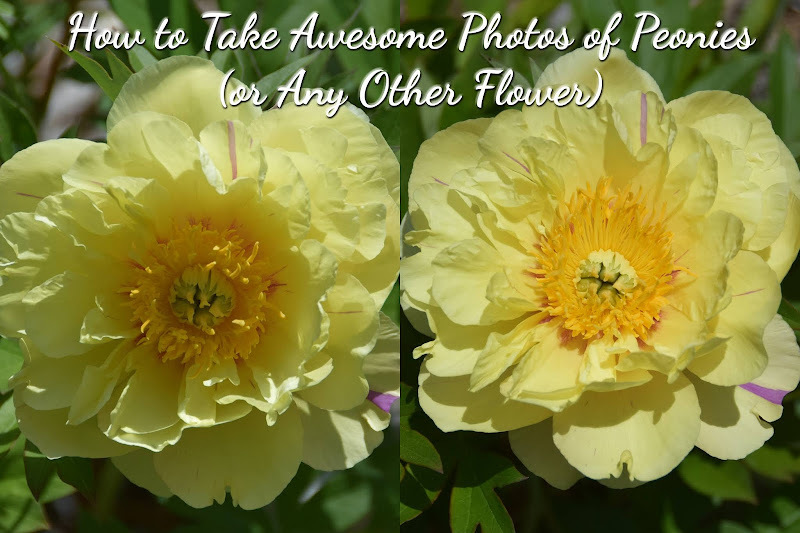 If you notice anything on the surface of your flower that will detract from the photo, remove it. There could be debris, dirt, grass, or whatever sitting on your nice flower. Don't leave it on the blossom. Blow it off or pick it off. There could also be ants, bees, worms, or whatever other type of creature on your flower. Unless you are taking a picture with the insects intentionally, then you need to either wait until they're gone or flick them off (if it's safe to do so). There nothing like having a beauty of a flower with a giant fly on one of the petals. Shoo those bugs away! 4. Background - Background is often forgotten when taking photos. Ever see a beautiful flower shot with a cinder block or landscape fabric or irrigation hose or bucket or shovel or (fill in the blank) in the background? (And you just can't help but think how much more beautiful the photo would be without said item in it.) Well, that's what background is all about. It sounds easy - just make sure the background is nice, but we are all guilty (myself included) of taking a photo with a less than stellar background. If you are taking outdoor flower photos, here's a tip to remember: Green is nice, hands and fingers (and arms!) are not. If you must prop a flower up in order to take its picture, please, please, please prop it up with something other than your hand (or arm), preferably something natural and something that does not show in the photo. Sometimes when photographing peonies, I will prop up the flower I want to photograph on another one of the peony's own stems. Sometimes the flowers are really uncooperative. So another option is to use a bamboo stick (or just any other stick from outside) to prop up the flower. Sticks are great because they can be broken and made to any custom length needed. They can also be easily hidden in the foliage. I usually try to make the stick a length that is just tall enough to support the bloom. One end of the stick rests on the ground, the other end rests just underneath the heavy bloom. 5. Angle - This one is a little more advanced, but worth it when you see the results you can create. Ever see a photographer step up on step stool to take a photograph? That step stool is all about the angle. Sometime adjusting your height or your position, relative to the subject, can make all the difference. The thing you are looking for in the angle may vary depending on your subject, but for flowers I am looking for the best symmetry (without sacrificing the Background - see #4). Find the best angle that creates the best symmetry. You many have to crouch down or stand overhead and aim your camera straight down. You may have to walk all around your subject until you find just the right spot to take the photo. Your flower may not be perfectly round, but if you change the angle enough, you may find a shot that makes it look pretty round. Or your flower may be shaped in more of an oval or oblong shape. Then the key is to try to balance the flower in the frame either horizontally or vertically. 6. Timing - This one is sometimes hard for me too (especially since I work 5 out of 7 days of the week), but when you can, try to Take your photos of the freshest flowers - first day blooms if possible. The first (or sometimes second) day flowers will be much more full of life than older flowers on the plant. Also some older blossoms tend to fade. You want to make sure that the flower you are photographing is full of water and not wilted. So this one kind of relates to #1 because you do need good sun for your flowers, but just be aware that some peonies will wilt faster as the day goes on (darker colors like reds, dark pinks, or dark purples). So make sure you try to photograph your darker colored blooms earlier in the day if possible. Also if your area has been especially dry and hot, then it might be a good idea to try to take all of your photographs in the morning to avoid wilted, tired looking peony blooms. 7. Multiples - Finally, take lots of photos! We're not on film anymore. So you can just about take as many photos as you'd like. Memory cards are pretty cheap nowadays. So upgrading to one that will hold more photos shouldn't be a problem. Take multiple shots of the same flower, and I don't mean like 3 or 4, I mean like 10. If you have a shot you really want to get right, take 10 of them. It's not like you have a person or animal for a subject, you have a flower. I don't think it's in a hurry to go anywhere. So you really do have the luxury (that you don't have with people or pets) to Take multiples of the exact same shot. Most of the time (over 50% of the time), when I review them later on my computer, my last shot is my best one. So take your time to get the perfect shot. The reason you're taking so many shots is not to publish all of them, it's to publish the best one. So make sure to take the time later to review and compare your multiple shots to find the best one. I know this is a lot to remember, but the more you practice these things, the more like second nature they will become. You won't have to intentionally think about each of these things, they will kind of become programmed in. Even on a good day, it probably won't be possible to get every one of the things on this list right for every single shot (see #7 Multiples). Just remember, the most important thing is to have fun! And to share your love of peonies with the world!! !